Snow Leopard lets you personalize the Dock by modifying its size, its position on the screen, and more. To access the Dock Preferences settings, you open System Preferences by clicking the gear icon on the Dock and open the Dock group. Size: Move this slider to change the overall size of the Dock. Magnification: With this check box selected, a Dock icon magically expands, like the national deficit, when you move your mouse cursor over it. You can move the Magnification slider to specify just how much magnification is right for you. This feature is useful for helping you click a particular Dock icon if you’ve resized the Dock smaller than its default dimensions or if you have a large number of items on the Dock. Position on Screen: Choose from three radio buttons to make that crazy Dock appear at the left, bottom, or right edge of your Desktop. Minimize Windows Using: By default, Mac OS X animates a window when it’s shrunk into the Dock (and when it’s expanded back into a full window). From the Minimize Using pop-up menu, you can choose from a genie-in-a-bottle effect or a scale-up-or-down-incrementally effect. To demonstrate, choose an effect and then click the Minimize button (the yellow button in the upper-left corner) on the System Preferences window. 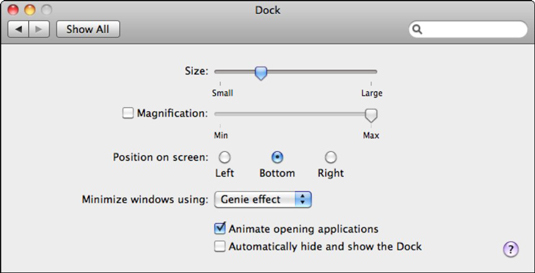 Animate Opening Applications: By default, Mac OS X has that happy, slam-dancing feeling when you launch an application: The application’s icon bounces up and down in the Dock two or three times to draw your attention and indicate that the application is loading. If you find this effervescence overly buoyant or distracting, deselect this check box. Automatically Hide and Show the Dock: If you like, the Dock can stay hidden until you need it, thus reclaiming a significant amount of Desktop space for your application windows. Select this check box to hide the Dock whenever you’re not using it. To display a hidden Dock, move your mouse pointer over the edge of the Desktop where it’s hiding. You can also change these Dock preference settings from the Apple menu.